Even with conditions as serious as stroke and brain injury, yoga therapy can be a helpful complement to regular medical care when practiced under the guidance of a qualified yoga therapist (start your search here). As an example, the Yoga for Stroke program provides yoga therapy to outpatient stroke and brain injury clients at the University of Maryland Baltimore Washington Medical Center and the Greater Baltimore Medical Center. Clients are individually assessed prior to beginning the programs, which meet in small groups with no more than five students per teacher. Yoga practices include breathwork, postures (asana), meditation, and yogic philosophy—all modified to accommodate individual needs. The group format allows for informal peer support and helps to address the depression and social isolation that can come with conditions like these. We’ve noted decreased hunched posture and muscle tension, plus increased flexibility, range of motion, breath control, and core strength in program participants. Yoga therapy’s effects go well beyond physical benefits, too, with clients also reporting decreased stress and improved relationships. 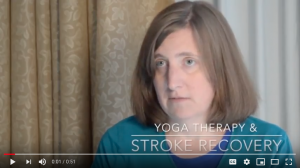 Hear from Yoga for Stroke clients first-hand here. Kelli M. Bethel, PT, C-IAYT, E-RYT 500, is a physical therapist and certified yoga therapist. She is the director of yoga programming at the University of Maryland School of Medicine, Center for Integrative Medicine, and the owner of Body Harmony Yoga, which operates as Tafiya Yoga and Wellness.